I love wearing white. 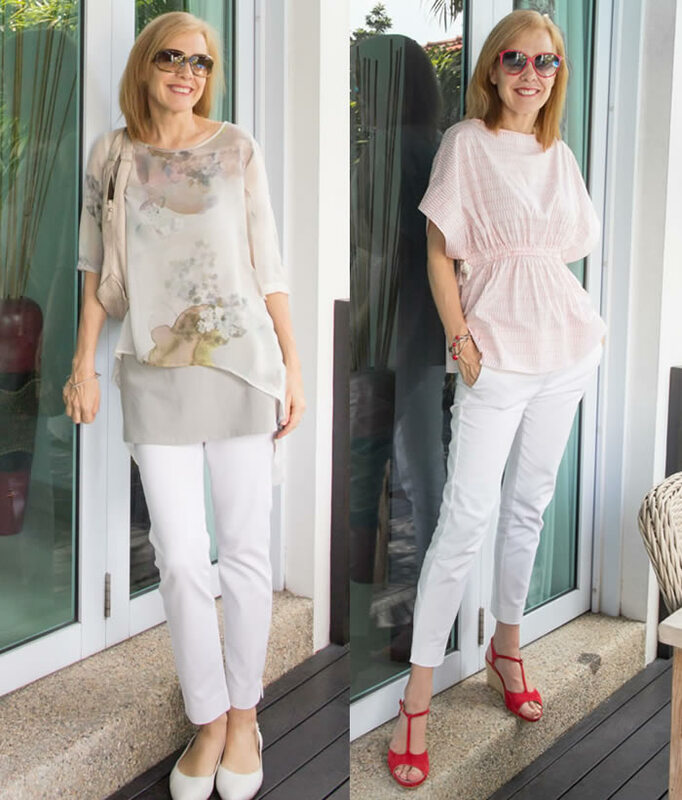 I find it such a fresh, modern and easy to combine colour, that white pants have become the ultimate basic in my wardrobe. 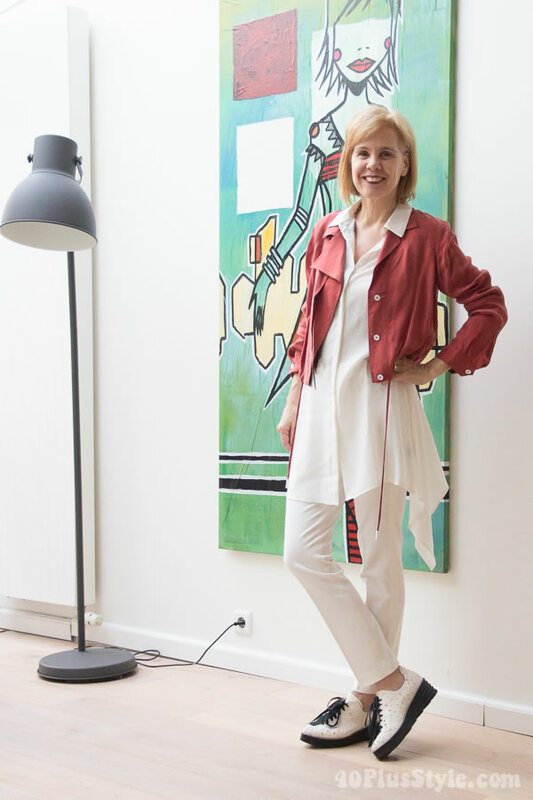 If I don’t know what to wear, I grab one of my white pants and either combine it with a top, dress, blouse or jacket. 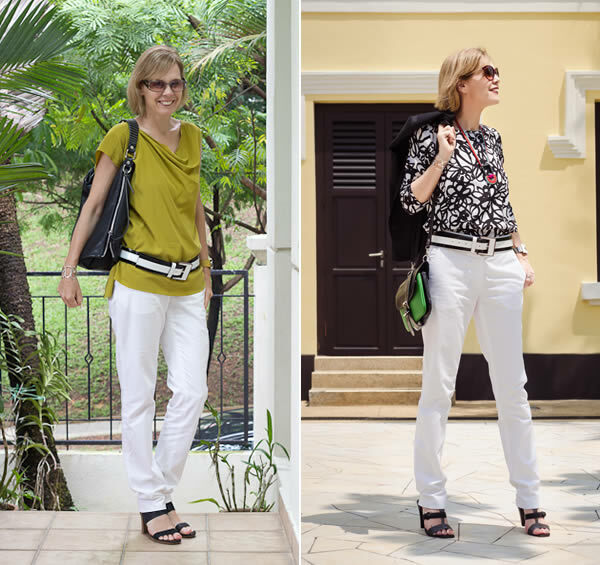 Here is update overview on how to wear white pants and how I wear mine many different ways! My white cigarette pants are my staple. They look good with almost anything and I wear them with dresses, tunics, short tops, blouses etc. They look good with a variety of shoes too. Mine is no longer available but these very affordable cigarette pants with lots of good reviews are very similar. White cigarette pants with a polkatdot top. 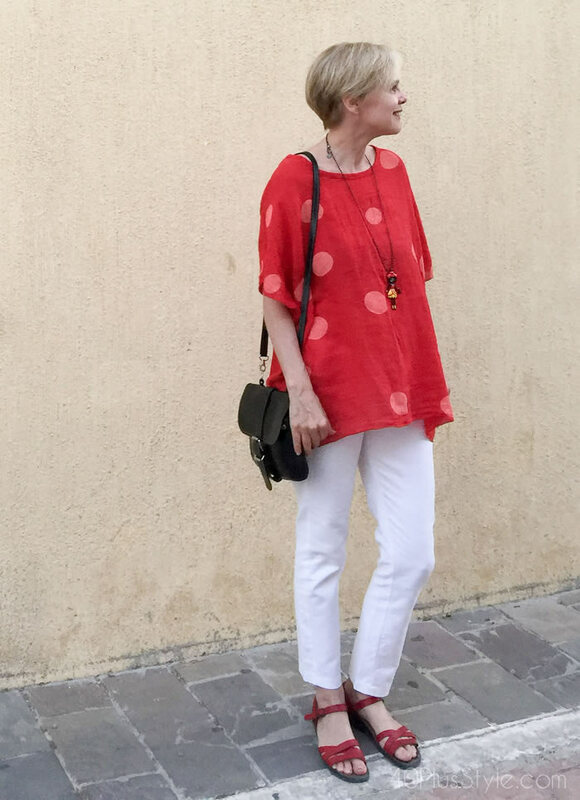 Want to have lots more inspiration on wearing polkadots, see our ideas on wearing polkadots this summer here. White is a perfect base for layering too! Wider pants are back on trend and I’m loving mine. These look particularly good with short tops as you want to make sure to still show your figure in white pants. 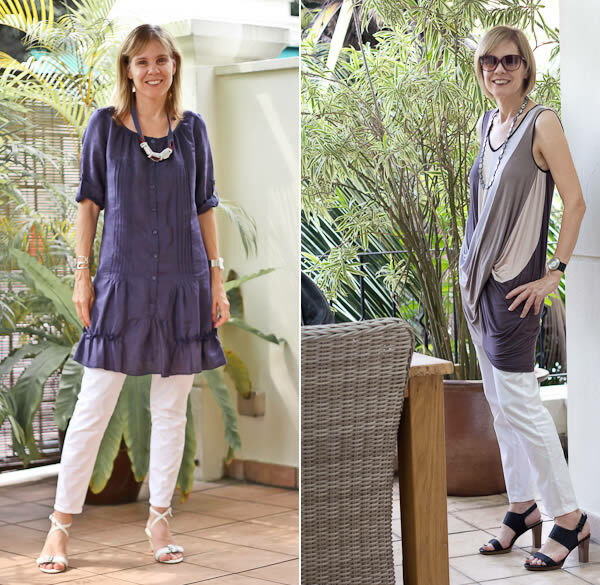 A loose wide top going to your hips is not recommended but a longer tunic that is belted at the waist can look really good! 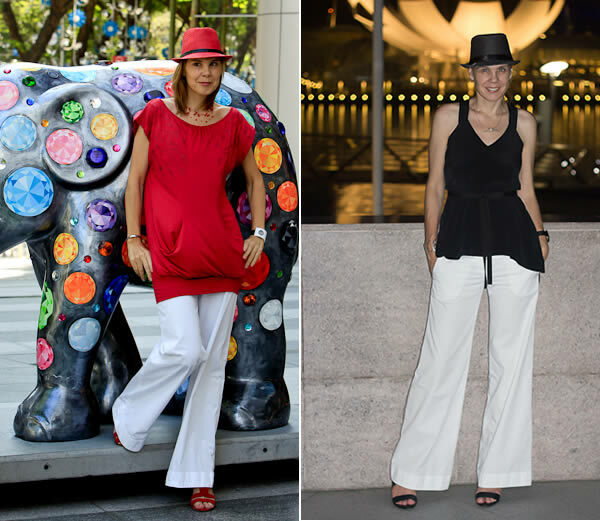 For more tips check out our guide on how to wear wide legged pants. The ones I’m wearing are no longer available but you may like the ones below. (they come in all kinds of colors). These were a long-time favorite of mine and have been featured on the site many times. Great for a laid back relaxed look and for creating a nautical style. You can wear them with t-shirts only, combine them with a belt and / or a blazer, with a hip (silk) top and even with short dresses. I wear them in casual situations and in the evening. Below are some that you can buy online now. You my also like our guide on choosing the right shoes for different styles of pants. I love wearing white for sports as well, especially skiing and yoga. 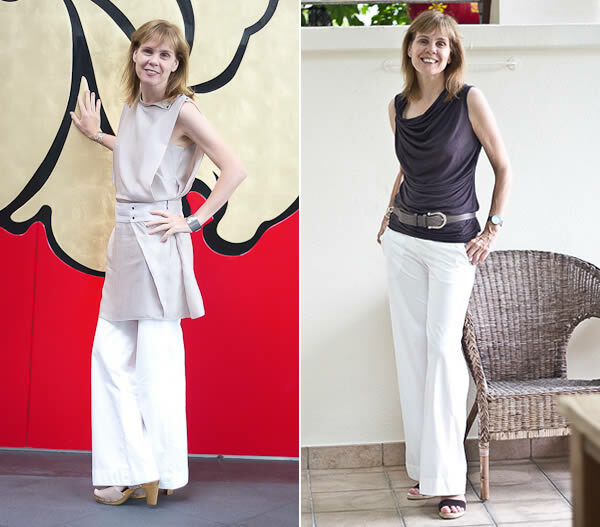 I own cropped white skinny jeans as well, which I particularly like to wear with short dresses. Great for a slightly hipper look or if you want to show off your shoes. This type of pant is a classic. They are made of a thicker cotton so not so see-through and have the perfect rise for my figure. They are so easy to combine with many of my tops and great to wear with belts. 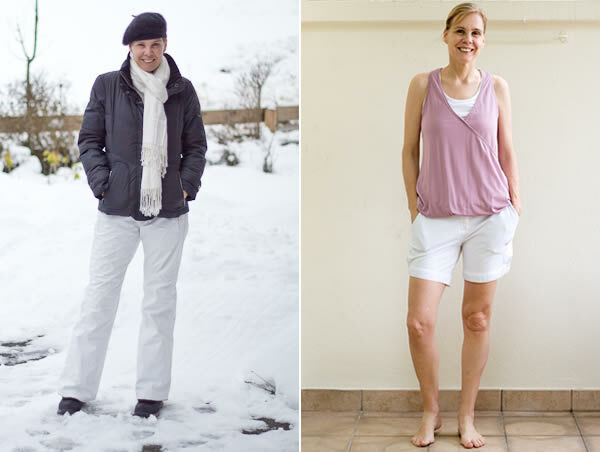 Although white is an obvious choice for my tropical weather, I love wearing white in winter too. 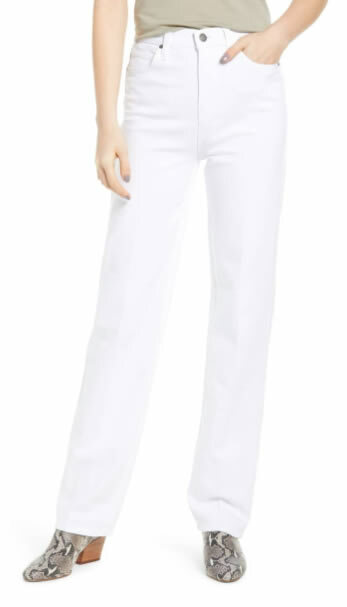 When the weather gets even warmer or you are going on holiday, knee-high white pants or leggings are perfect. I absolute love the knee high leggings from Stella Carakasi. Want more tips on wearing leggings? You will love our guide on how to wear leggings. Are you wearing white yet? If you have always been reluctant to wear white, give it a try! Don’t be afraid that white makes you look bigger, but instead focus on finding the perfect fit for your body type. Play with different tops and shapes or try wearing tunics or short dress over your pants. White is such a great versatile color especially in summer. Give it a try and mix with clothes from your wardrobe. Do you like to wear white? 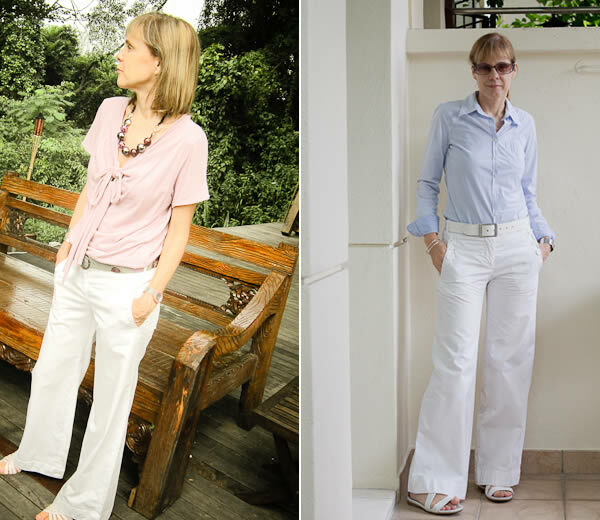 Like this article on how to wear white pants? Share it on Pinterest! You know what I just realized? I do not have one single pair of white pants! I have never found a pair that I liked! You inspire me to find a pair as you look fantastic in all versions! Probably because you like all your skirts too much. It would go wonderful with all you colourful clothes! I wear white blouses and tee’s (usually under a cardigan or pull-over sweater, but don’t have any white pants, skirts, or shorts. I’m a bit of a mess and would end up with something splashed on them. I do have a pair of very light khaki slacks, and a light khaki skirt, so that’s my version of white. Oh Rita my sister. You know that I am also a grubby person who should not be allowed to wear white. I already told you that someone spilt red wine on me when I wore white linen trousers. Well, when I bought some cut off white jeans last year, I actually bought 2 pairs in case as I wasn’t confident I could keep them white! Suzanne – do we know what sort of engineer Rita is? Two pair of white anything is a great idea, Lorraine…just in case. I definitely do that with t-shirts! Happily I’ve avoided wine tossers so far. Top Siders Rita?! Sperry Top Siders? You must have been dangerously close to the deck shoes – you might even have touched them while reaching for the sneakers. LOL! The next thing I know I will be reading about your deck shoes matching the guy’s shoes under the conference table! Did you get the Milly for Sperry floral sneakers? She made deck shoes in the same print. They are so cute! I think the sneakers have a lime lining. Such happiness. AND – they would look great with white pants! LOL!!! I saw deck shoes but did avoid picking them up! My aren’t they sparkly these days?! Heehee! Yes, I got the Milly floral sneakers and they do have a lime lining. 🙂 They really remind me of a pair of Vans I used to have. And yes indeed…they would look great with white pants! They are cute with jeans, as well. Wow Rita! I thought you were the ‘warm and comfy’ one and Suzanne is the ‘flashy’ one (Suzanne’s words!) but these sneakers are……well……..flashy! Can’t wait to see pic with white jeans – a marriage made in heaven! Oceanographer eh? I get the picture. They cruise around the world (but always make sure it’s somewhere hot and sunny) and ‘pretend’ to write down every time they see a whale. And they call it a job! Yeah! Lorraine, that sounds like a fabulous oceanographic job…where do I sign up?? 🙂 I focused on physical oceanography (waves, tides, currents, air-sea interaction, etc…more computer modelling than actually getting to go on a boat. What I would LOVE to do is volunteer on a Great White Shark research vessel. They are fascinating, beautiful creatures. You’re right…I definitely like to be warm and comfy, but I’d say I’m more “quirky” than “flashy. I do need to figure the photo taking thing out…time to stop “lurking”…LOL! Hey you two, are deck shoes considered ‘naff’? Not “naff” – as in tacky – but very “preppy”. The preppy look is East Coast, old money, traditional. It is Ralph Lauren and Tommy Hilfiger. It is a lifestyle more than a fashion statement. It is taken seriously by many people though. My son attends a university called the “Ivy-League of the Midwest” and it definitely has changed the way he dresses. He wears chinos in place of jeans, collared shirts, v-neck sweaters, and yes – deck shoes. Every single boy in his Fraternity owns deck shoes. At Christmas my hubby and I were in a nice department store close to our son’s college. We saw a huge display of deck shoes – probably about 60 pairs in all colors and fabrics. Less than 3 hours later there were 3 pair of shoes left on the shelf. I asked the salesman about it and he said they can not keep them in stock. As soon as one student walks in and sees them, they place a notice on social media (iphone, ipad) and the shoes fly out of the store. It is amazing. Suzanne, Sounds like a good business opportunity! Preppy? Ha, when I was trying to define my style during Sylvia’s exercise I did start to think I might be drawn to the preppy look……………but I don’t own any deck shoes! My husband does, though….. should I be worried? Ha ha Sylvia! I think that market is covered! And it would be so dangerous for me to ever work with shoes in ANY way. I would owe a huge bill at the end of each month no matter how many pairs I had sold. 🙂 I am doing so much better about shopping this year though – all thanks to the things I have learned from 40+Style. I have a list of things I need (as opposed to WANT) and I ask myself what items are appropriate for my life right now. I see lovely dresses every day but they would not get worn so I leave them in the store. That is a huge step for me. Lorraine – your hubby is fine in deck shoes by my count (I do not know a guy who does not wear them) but Rita may have a different opinion! LOL! Just went shopping and didn’t buy anything. I think I am losing my touch! It’s the 40+ Style effect! LOL Rita! I have good friends who live in Houston and I have always been told that the “Ivy League of the South” is Rice! But I am well aware of the university you attended. For 4 years we thought (and planned for!) my son to attend said school. Hubs and I were even going to rent a condo in the area. 🙂 Then, two months before high school graduation, J was made an offer he could not refuse. Even the Blue Devils told us to take it! We have no regrets and J could still end up getting his grad degree at your university. Very cool! 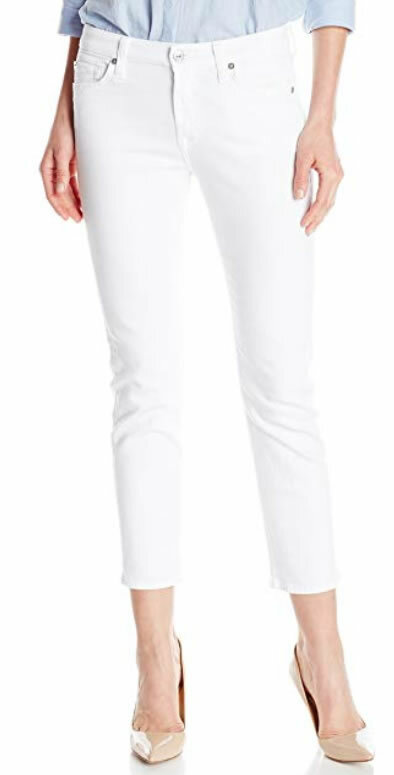 I only have a white capri, but after seeing all your wonderful outfits I am going to get myself not one but two white pants. I would like to get the skinny crop pants and the boot cut. This is now on the top of my wish list with the asymmetry dress. I have lots of tops to go with them but will need some clourful shoes. Just bought myself a green bag for the summer. 2 fantastic items to be on your wish list! Good lucking in finding something great. White pants rule! I love your colors and contrasts. I usually go the layered soft neutral route and wear them with grays, beiges, etc. 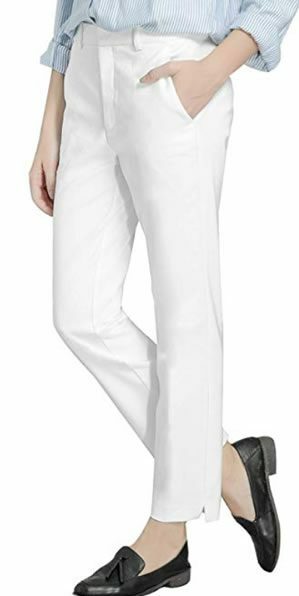 I love my white jeans, and I’m on the lookout for white dress pants for summer. I like combining white with dark blue, greys, beiges and nudes. What a great selection of outfits! Due to the weather I am a bit limited in wearing white trousers but do like them a lot. I always make sure they are not see through and also they are not too tight. Yes, I’m going to pay more attention to that too. I don’t actually like some of the pockets shining through…. 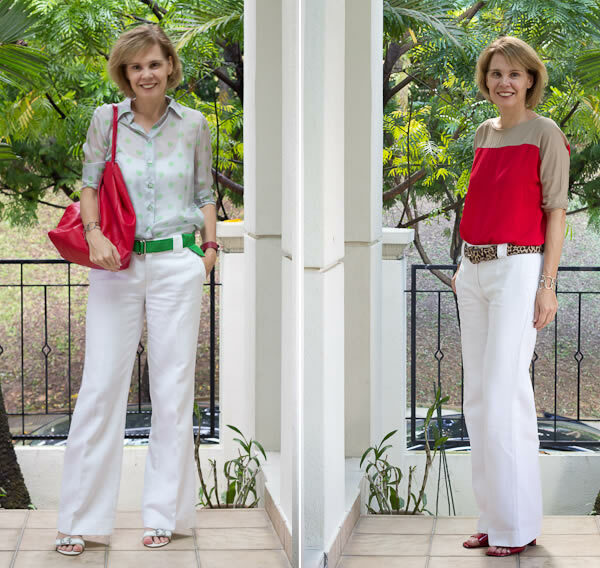 I never owned any white ‘pants’ until a couple of years ago – two reasons: 1. 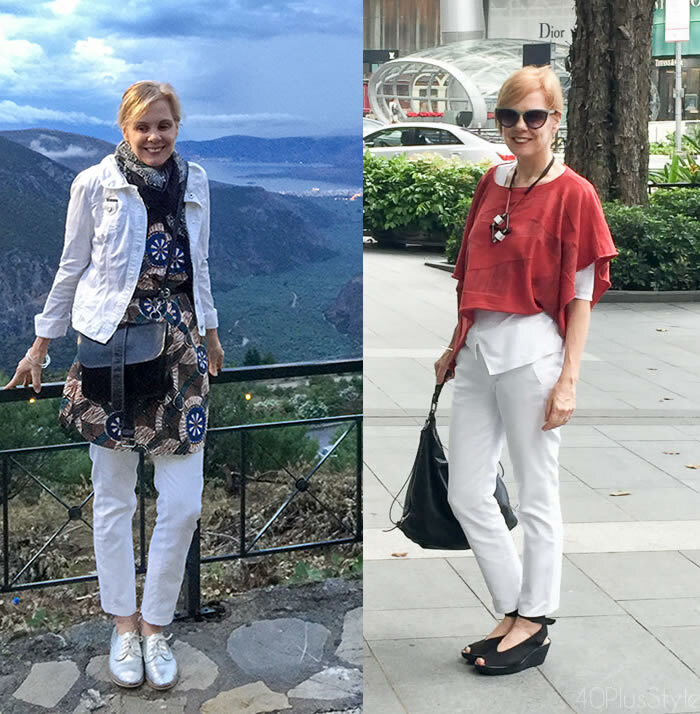 I was always told they make you look bigger and 2. in the UK there was always a thing about white jeans (in particular) being a bit ‘naff’ (and I can’t think of an better word)….. However, I think you look great Sylvia, and I am now embracing them, despite not having a huge amount of opportunities to wear them in the UK. You have demonstrated how versatile they are. Wear them on a nice sunny day in the UK Lorraine. White in winter is fabulous too! I do like ‘winter white’ and have an off white coat but not sure about trousers here! LOL!…….it means ‘lacking taste or style’ according to the dictionary…….Oh dear, I think I have managed to insult everybody on this site in one go! Perhaps you will all tell me to naff off’! (its other meaning is ‘go away’!) Ha ha! We can not wear jeans (of ANY color) to one of our country clubs and in certain areas (the dining rooms) khaki is forbidden also as that is what the servers (waiters, caddies, Pro Shop clerks) wear. Maybe jeans are considered naff by some people in the USA and I just did not realize it. 🙂 At our local (more family friendly) country club the only rules are 1)no blue jeans/shorts and 2)only shirts with collars. White or colorful jeans are okay. If you do come over to the UK please wear your white jeans – otherwise it will just be me!!!!! I cannot say more on this topic for fear of digging a bigger hole for myself! No hole dug from where I stand Lorraine. 🙂 I will bring my white jeans to the UK and we can be naff together. We will look so awesome we will make naff the “in” thing to be! LOL! I’ll try to get Rita to come too – with her Top Siders! LOL! You might not want to forgive me so readily if you look at the forum (3/4 sleeves etc) as I think I have insulted you again……oooops! Anyway, if I worried about looking naff every time I went out I would be a hermit! I went to check the forum – you had me a little worried Lorraine! But all is well. I’m not sure what exactly you have pictured, but I do not wear 3/4 length sleeves and 7/8 trousers at the same time – lol! The main thing I have learned from Sylvia is the 1/3 to 2/3s rule. I make sure my entire outfit is balanced. And – I only wear one statement piece at a time – blingy jewelry OR a great pair of shoes. I am not a “lot going on” type of dresser. I try to control the “flash”. 🙂 For the past 3 months the only thing anyone has seen me in is my fur trimmed parka, tall boots, mittens, and big sunglasses. None of my neighbors are even sure I still have wrists or ankles. Ha ha! They only see a giant ball of fluff! We have so much snow today that the banks tower above my head. One of our neighbors helped me dig out with a front-end loader. That is serious equipment. Spring is coming, right? Loving Rita’s maths on the forum. What with fractions and percentages I can’t get dressed in the morning! Girl Math! You’ve got to love it! That would be so much fun. We would have to dig Suzanne out of her snow drift first! I am hoping she doesn’t embrace the neutral trend while she is shovelling snow or we won’t find her at all! I love tea too – especially with a scone, jam and clotted cream! Sign me up for the tea and scones! Yummy! But I am not wearing capris. LOL! 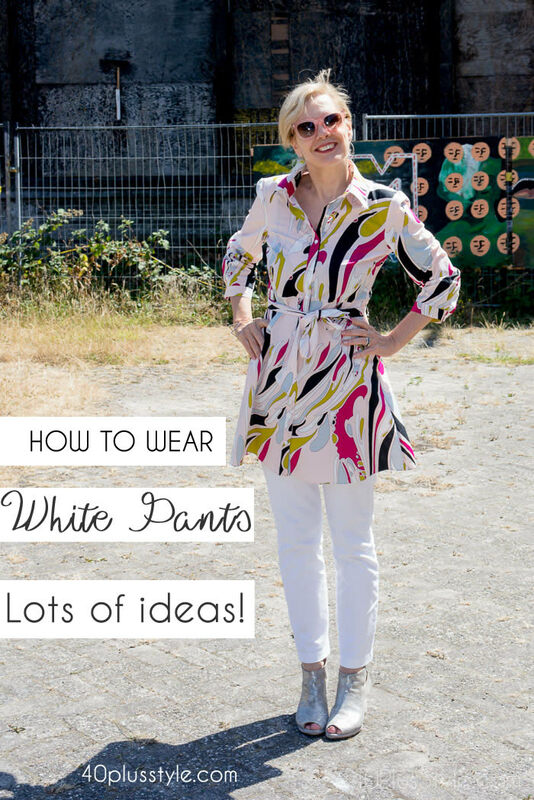 Do you wear white trousers (or should I say pants! LOL!) in winter Greetje? I can’t help thinking I would get some funny looks here in the UK. I would if I could find them. Most of my white trousers are too thin. Really summer stuff. I have a grey-ish babyroy pair of trousers which are really light, nearly cream. And I have cream coloured skinnies. I wear both of them with lime and brown. No funny looks at all. I would wear white trousers as well, but winter quality. Just cannot find them. I don’t think people look at you funny for that. Would they? I would probably not notice it. Well what do I know? I just saw a girl friend and asked her if she would wear white trousers in winter and she said she wore some this past weekend! Admittedly, it was inside in the evening at her friend’s house for a meal but it was white! I know what you mean about the fabric though. You just don’t see them in winter weight fabric. I love wearing white. I actually gave away my white pant suit last year and most definitely need to replace it. Your pictures just gave me the motivation I need. I’m torn between white skinnies, crop pants, or a more tailored look. Any suggestions? Get them all – I did! What white trousers are to you, are black trousers to me. Also to do with the climate of course. 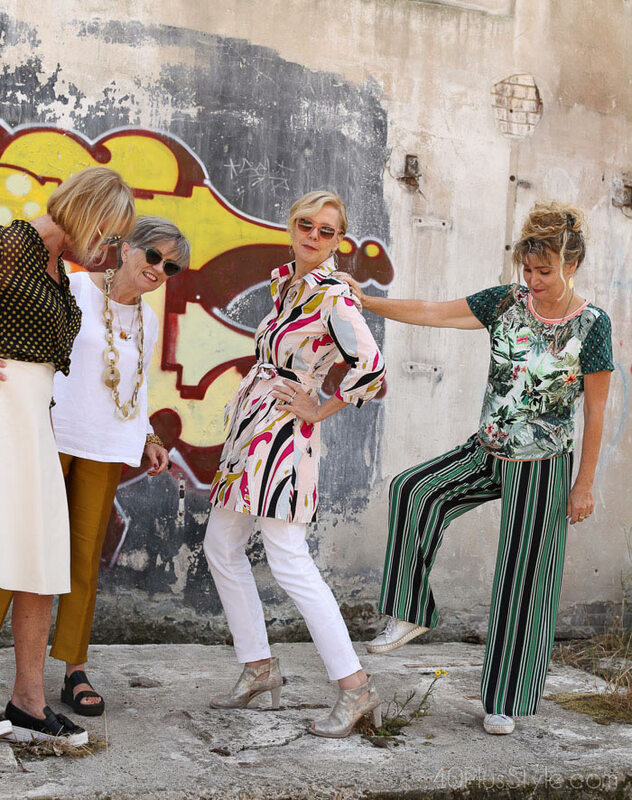 But I do own quite a selection of white trousers as well, mostly skinny-ish, like yours or capri and yes I wear them a lot in summer. The sailor trousers are not that good for me. You have hips and a tiny waist. On me they make me look like a triangle with the point down. And thanks for the hard work. This article will have taken some time to compose. I adore white! I’ve been wearing winter whites but can’t wait for spring to really get into it. What a GREAT collection of outfits! So many inspirations! Hurray! White is the color for me and I totally agree with jeannie@gracefully50: It is an inspiration indeed! The greatest thing? I live in the Caribbean so I get to wear them all year round! thank you Lenore. Good to read you enjoyed the post! I LOVE white! 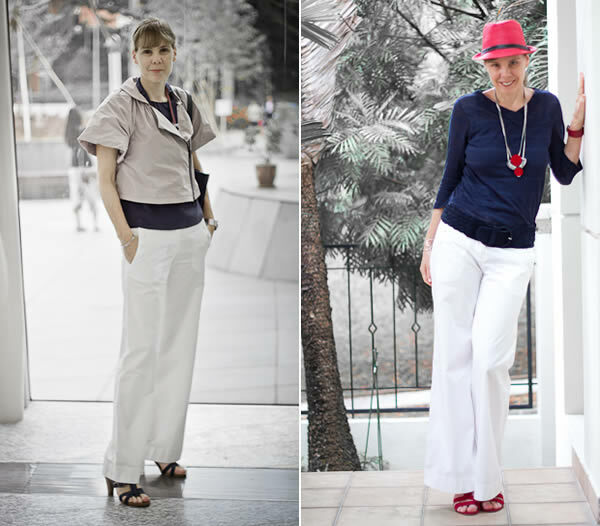 Am ditching all black for mostly white – yay! Are little white tennis shoes trendy? Not trendy I believe, but they are always good. If you want to be really trendy on the tennis courts then go for colour! White shoes for normal wear are definitely hot! They are hard to find… I’m looking for a replacement! I found your blog through Adrienne today. We write together on Skimbaco. Great looks. Loved you in the green on her post today. Thank you Leigh and welcome to my blog! I love all the outfits you created with different styles of white pants. Now I can’t wait to pull out my white pants. I would have never thought to combine them with a short dress. You have great style! Hi Desiree. Lovely to hear your feedback. Wearing a dress over pants is a style I wear quite often. It’s a great way to wear your dresses more often, and I find it’s a very flattering look for many women! Thanks for the nice feedback Ari! Thanks for the tip maggie! Fabulous! I’ve always been wary of white pants, but you make each outfit look so chic and effortless. I think I may have to add a pair of white pants to my closet. I honestly hadn’t thought they were so versatile but they really are! Everyone looks great! For me, white is going the way of black—out of my closet. I still don’t mind black on the bottom half, but I prefer off white all around. I rarely even wear my white sneakers. They seem to glow on my feet. I am pretty impressed with the way you style with white pant. I love the sailor pants style you created with different shirts. Also, short dress gives me another idea to adorn myself in summer days. Honestly, this helps me in finding the best pant dressing for me. I really appreciate you for crafting these style. Wow you own a lot of pants! Myself I own exactly one, worn it only once and is still in the back of my closet. I have a love/hate relationship with white even though the colour (is it really a colour?) quite good on me. I think it just attracts dirt and mysterious stains. You have created some great looks; others l thought were not as successful or maybe too dressed down/casual with some items that are inherently dressy. This is probably because I’m a petite and would prefer not to wear anything that may cut my proportions off. So the wearing pants as a substitute for leggings or hose is a big no for me. I think it would be far better for me to invest in opaque White hose and go for that vintage 60’s youth culture doll look. For instance, in that beautiful colorful, A-line dress would be a good candidate with either a white pump, a Mary Jane, or some other colourful shoe that matches the print… Add a headband, fun dangly earrings. The sixties casual look is very easy to achieve, that’s what l love about it. For sure. All these images are just here to inspire you and give you ideas that work for your body type and style. You certainly don’t have to like all looks. Great to read it has inspired you in some way. Have fun styling! Next post: A new skirt and my picks from the Nordstrom Anniversary sale!